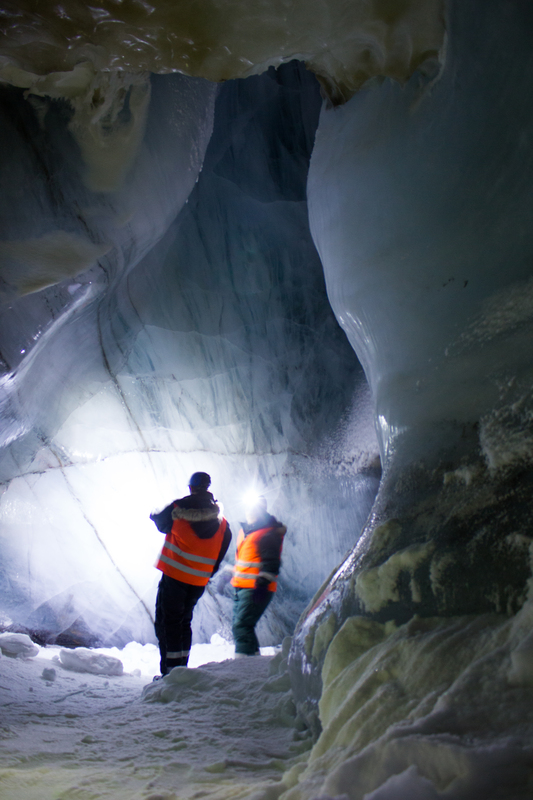 A glacier is more than an ice cube. Rather than being solid, uniform blocks, glaciers can have incredible variations throughout in terms of structure, temperature, and movement. 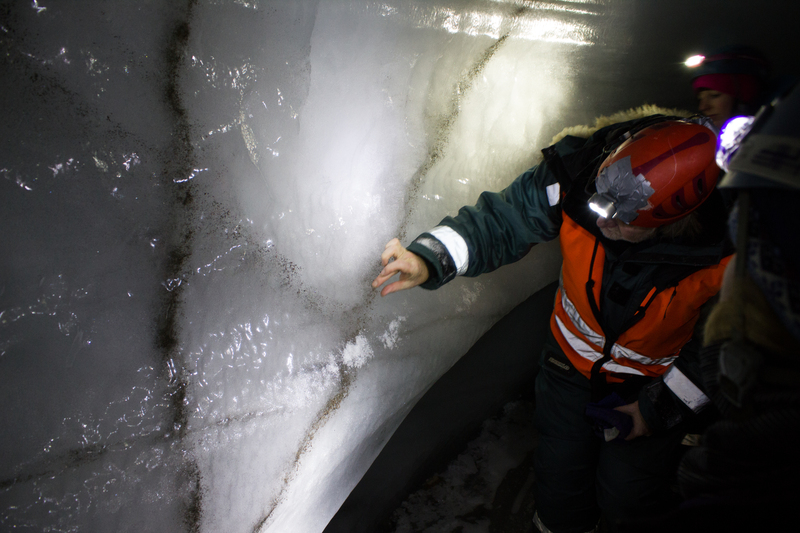 The surface and the base of a glacier can communicate with each other, and the language of this communication is water. 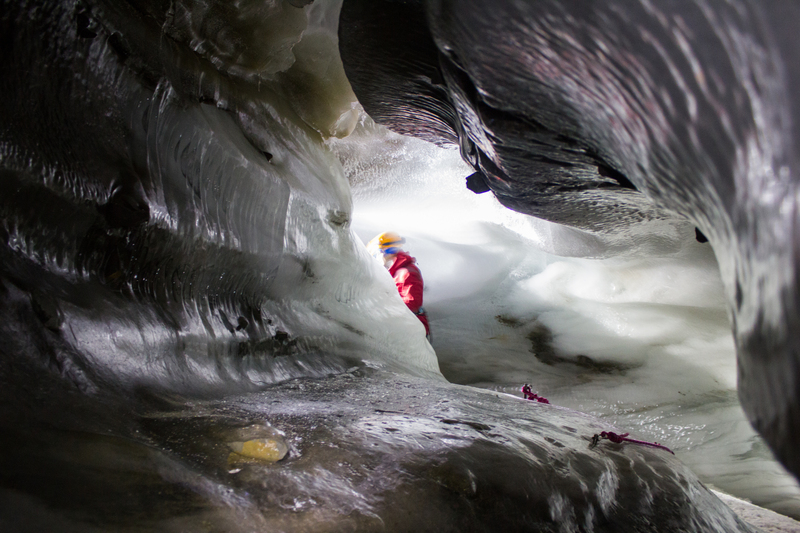 When ice and snow on the surface of a glacier melts, it can produce a lot of water. 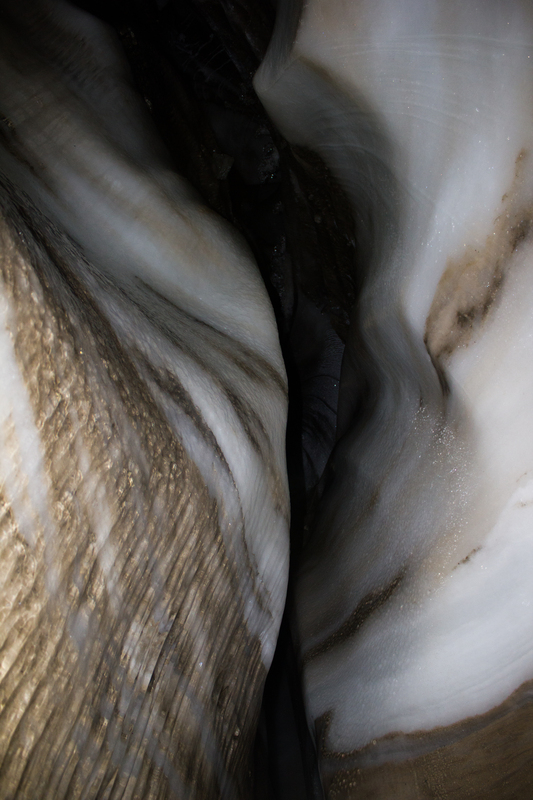 Streams of this meltwater flow over the surface of a glacier during the warmer months of the year. These streams can cut or ‘erode’ into the glacier, creating paths or channels which the water flows through. 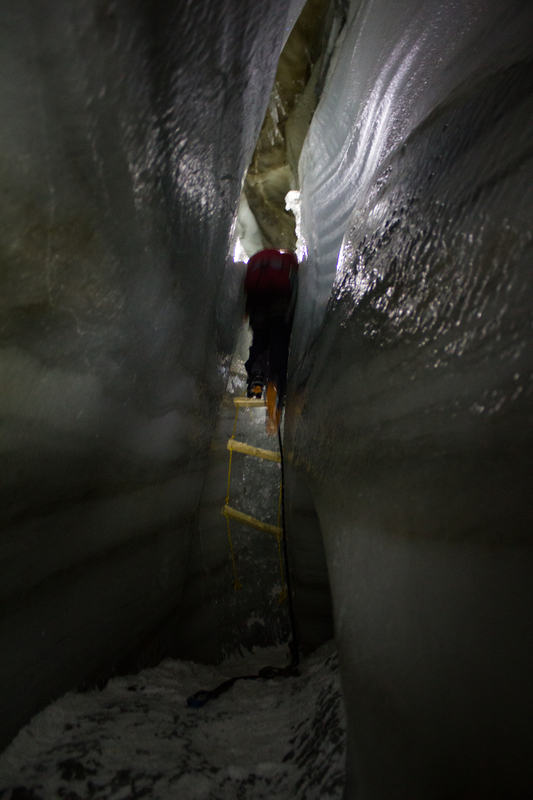 Over time, these channels can cut deeper and deeper into the glacier, their roofs closing over to create tunnels through the ice which can bring the meltwater from the surface all the way down to the bottom of the glacier. 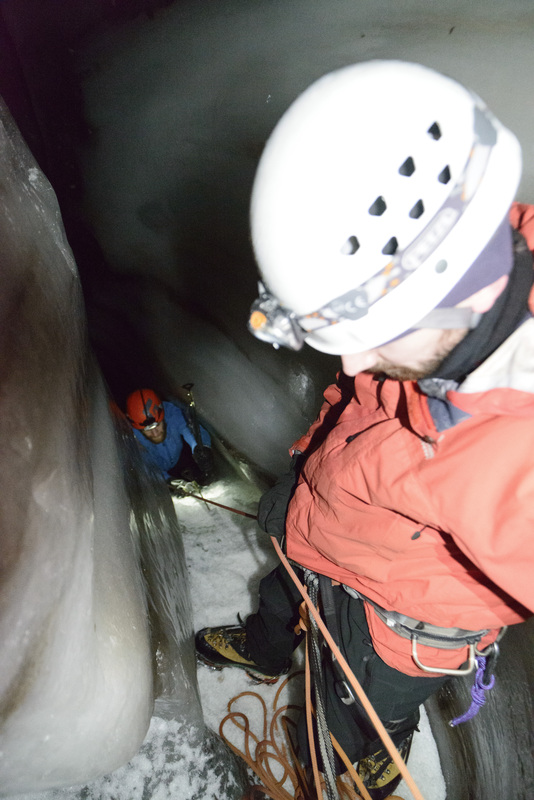 This is important because increasing the amount of water underneath a glacier can encourage it to slide faster. 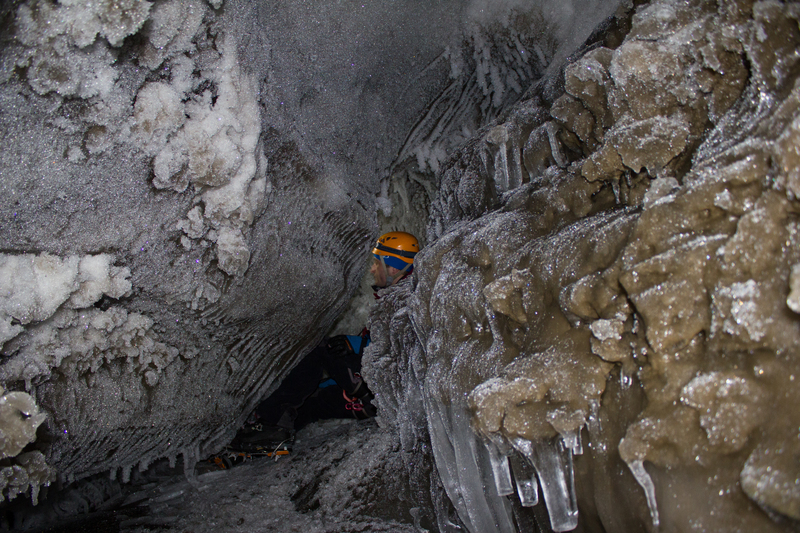 During the cold winter months, melt channels are generally dry. 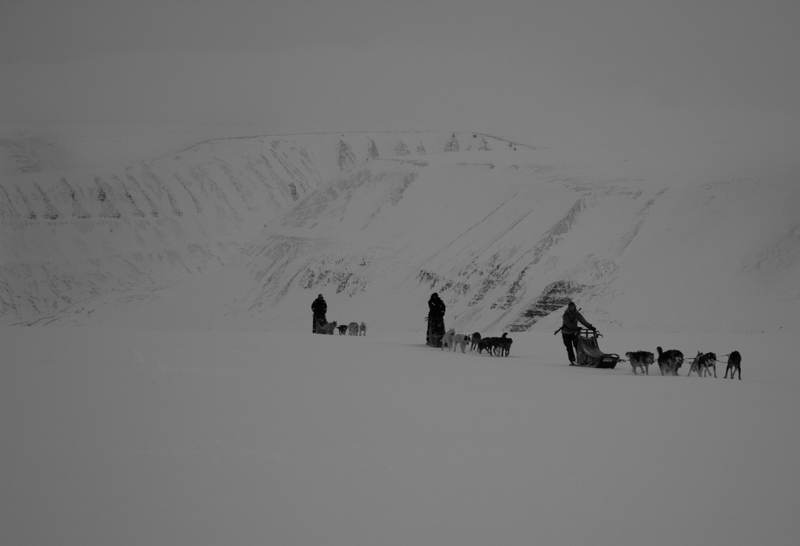 We had explored one of these channels previously on Scott Turnerbreen (see Svalbard Part 2: Balancing Act), and decided that some more time under the ice was needed. 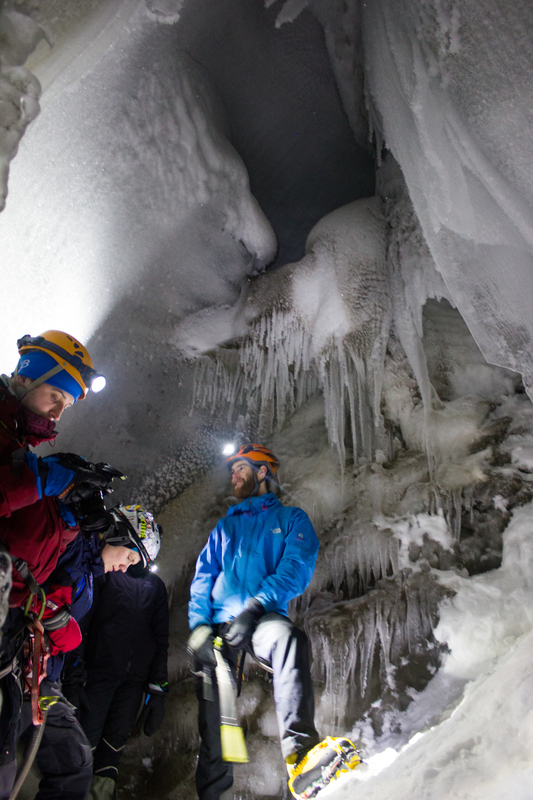 There had been reports of an excellent ice cave on Larsbreen, a glacier within an hour’s hike of Longyearbyen. 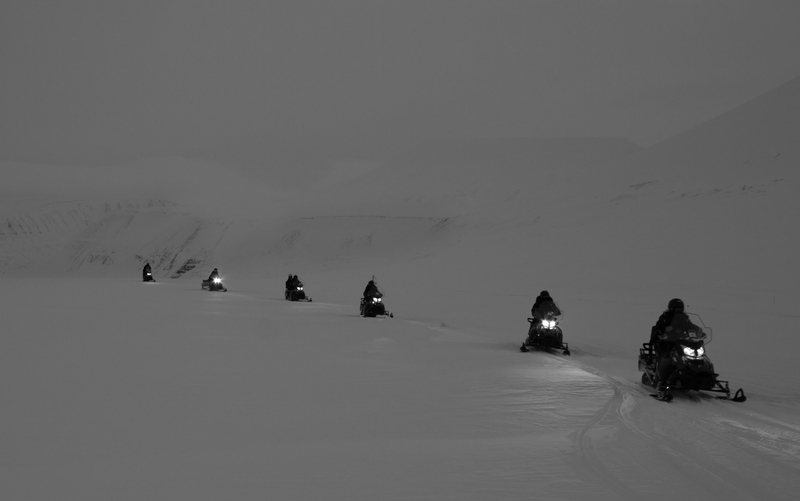 So one Tuesday evening, with duties at UNIS finished for the day, Tom, Ellie, Jelte, and myself met on the outskirts of the village, and began the trek to the glacier. 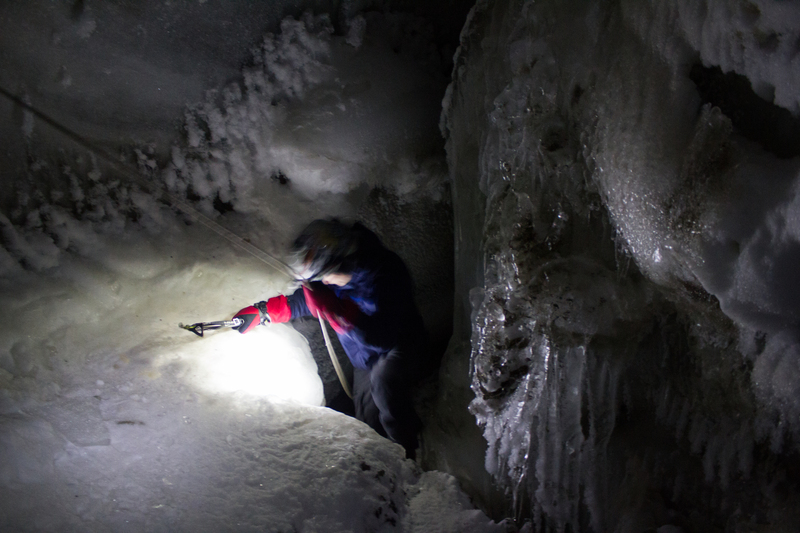 Our plan was to explore the cave for a few hours, and then being a bunch of idiots, to stay overnight inside the ice. 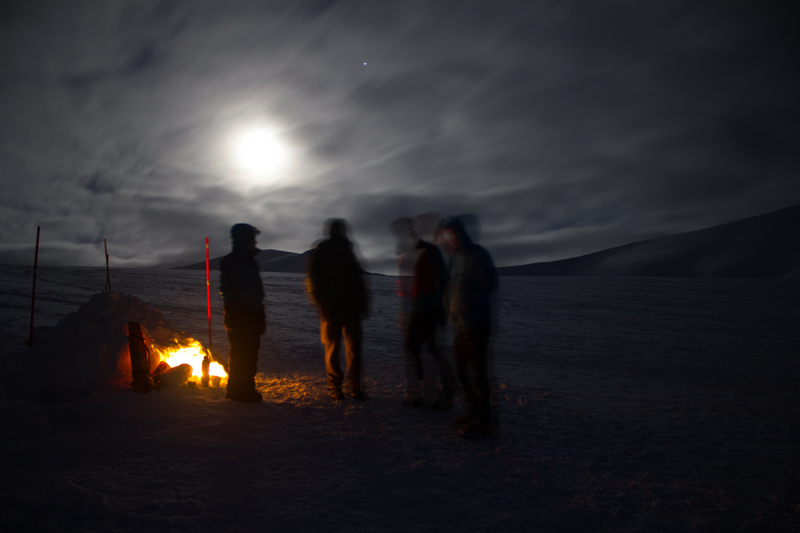 Nighttime in the mountains above Longyearbyen. 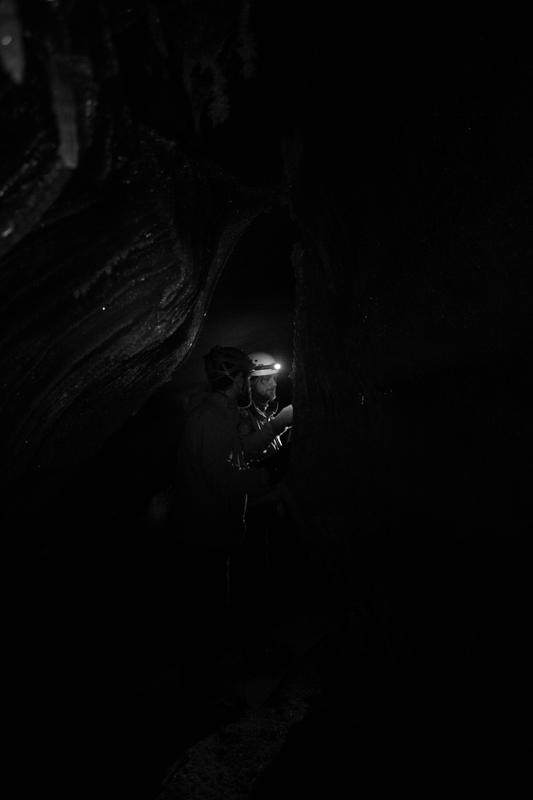 At the cave entrance, on Larsbreen. 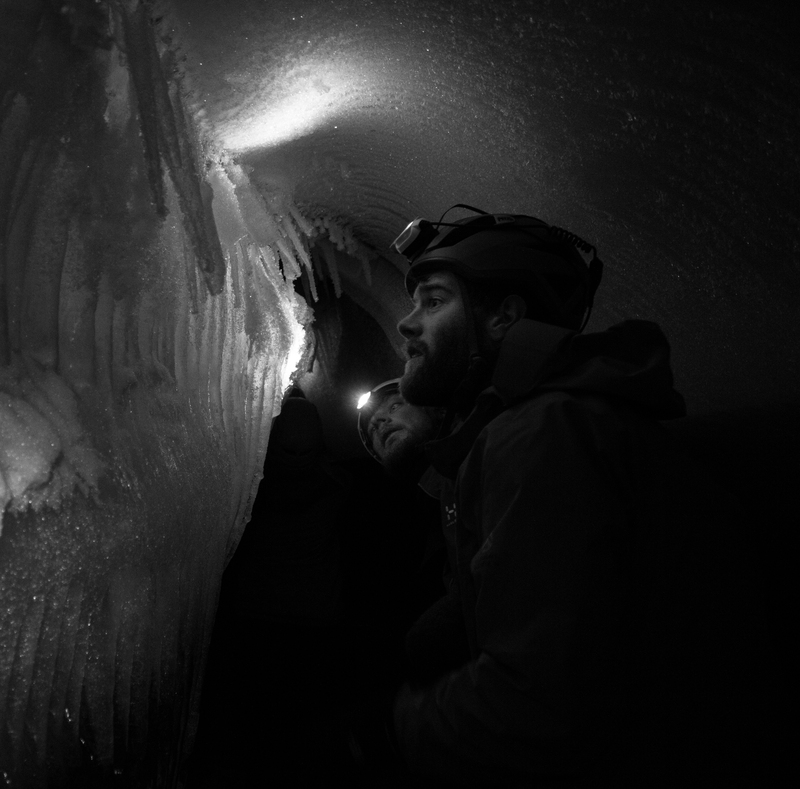 The walls of the channel were lined with a huge variety of beautiful and delicate ice structures. 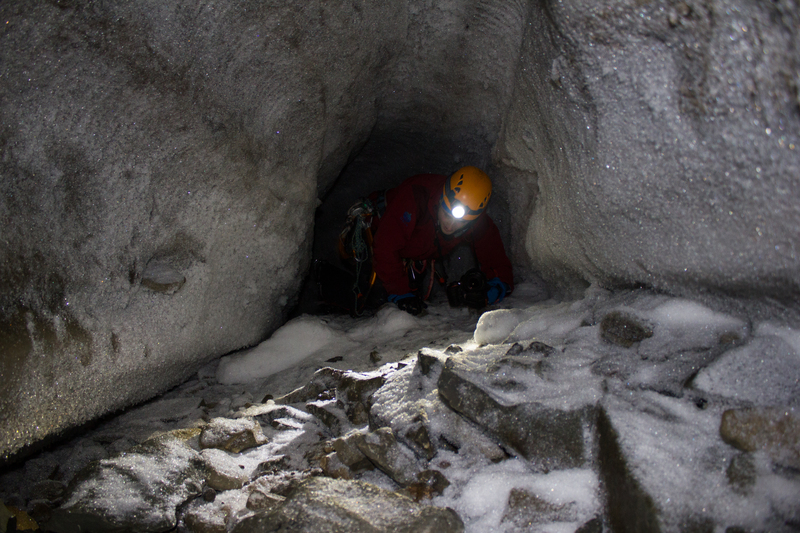 By the light of the moon, we found the entrance to the cave; first squeezing into a tunnel down through the overlying snow to get into the glacier itself. The passage through the ice twisted, widened, and narrowed, like a desert rock canyon; in sections coated in fragile crystal structures, then changing to smooth, swirled patterned walls like polished marble. We followed the channel as far as we could go, descending through a series of levels and passages until we were forced to stop at a major drop; the location of what would have been a waterfall during the melt season. 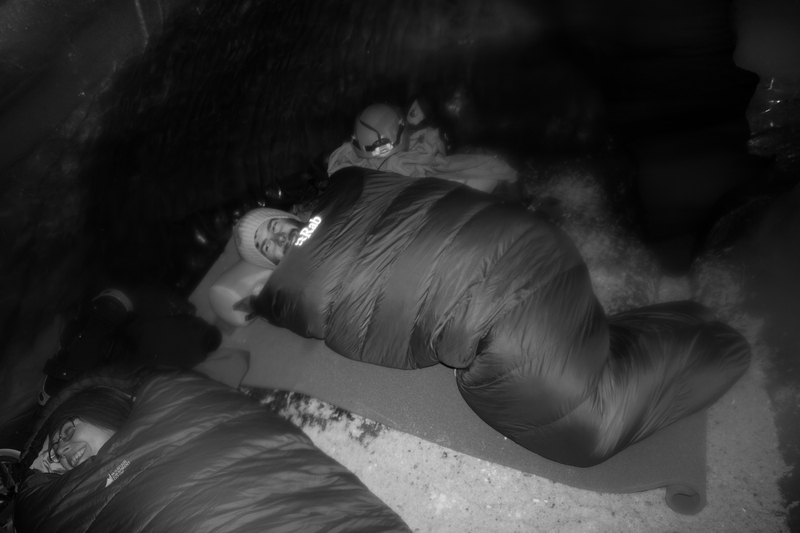 We picked a spot where we could roll out our bags for a few hours, and returned to the surface for some frigid air before sleep. 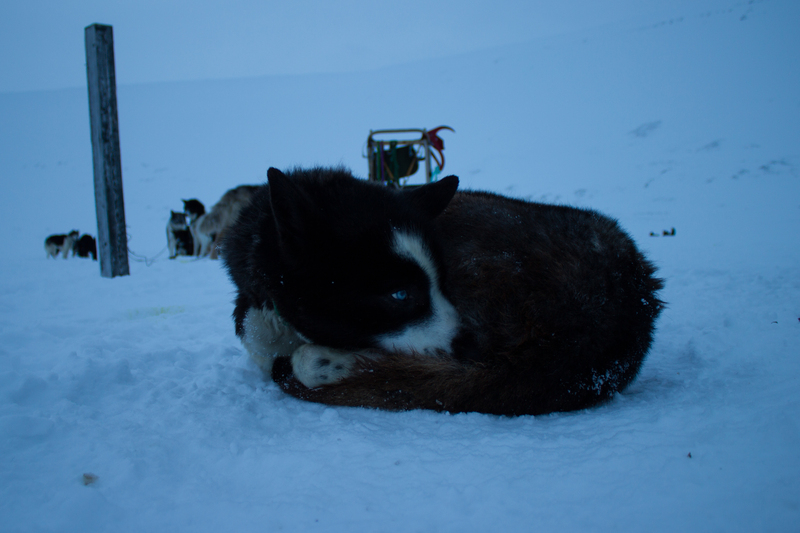 On the way to the surface, I had a ‘how did I get here’ moment; crawling out of a glacier through a snow tunnel in the middle of the night, with a rifle on my back to watch out for polar bears, and being greeted by the northern lights. 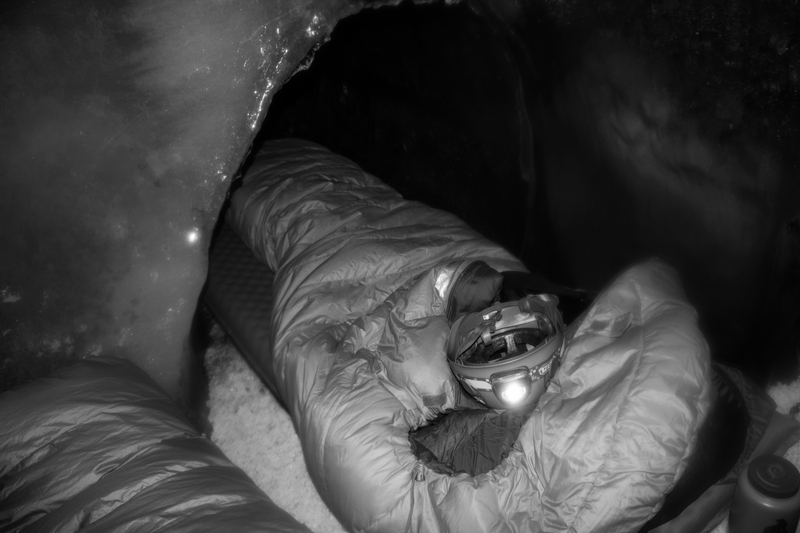 Our home for the night: a cosy ice chamber inside the glacier. My choice of sleeping spot, or as it became know as, the ‘MRI machine’. 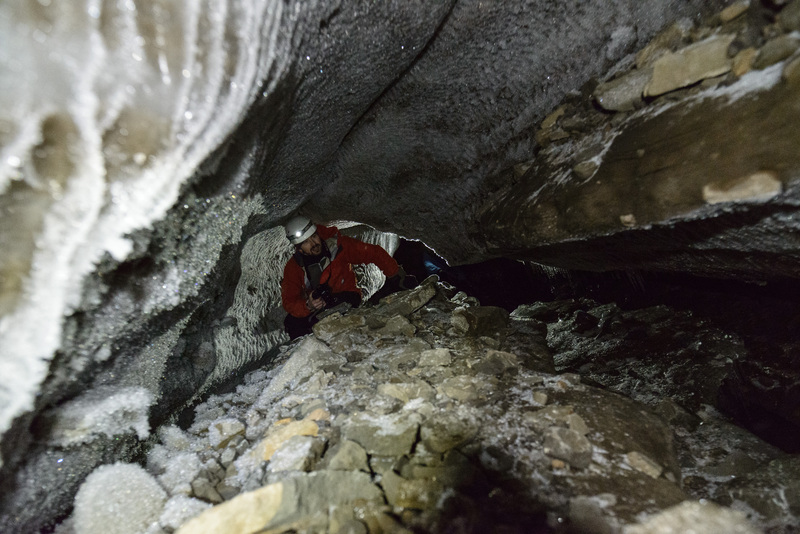 Our night in the glacier was a memorable experience, but it felt like the caves had a lot more to show us had we been willing to push a little further. A few days later, we returned to Larsbreen. Armed with ice climbing gear, Tom, Andi, and myself would attempt to work our way down some of the larger drops that had stalled us on the previous visit, and see how deep we could get. 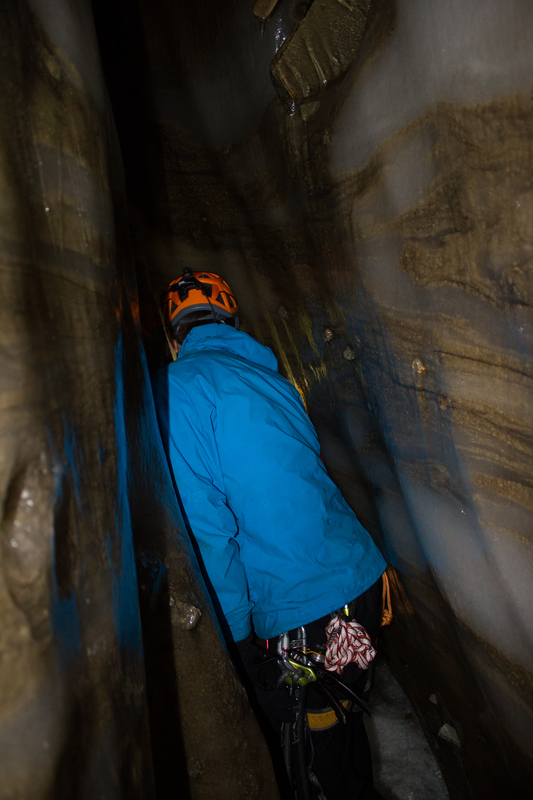 Descent was carried out through the use of ladders, fixed ropes, and rappels for the longer drops. 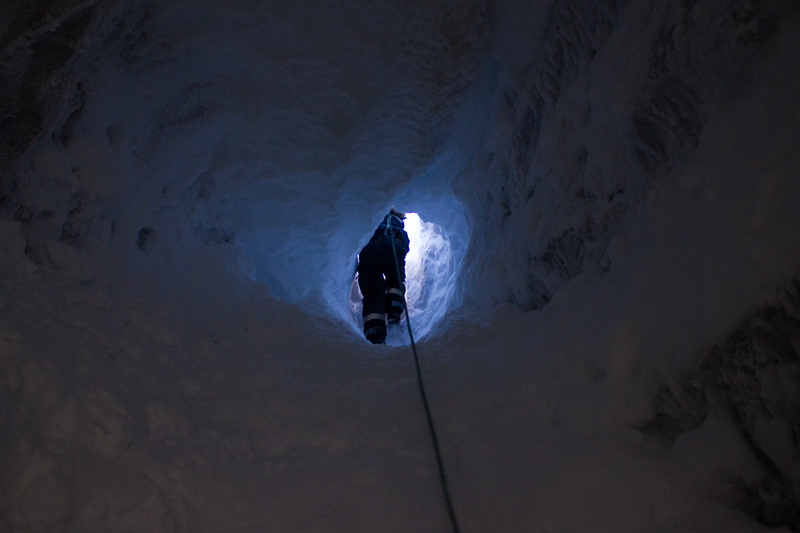 Climbing my way up through an ice chimney. Tom, about to drop over the edge of the first rappel section, which was extremely narrow. 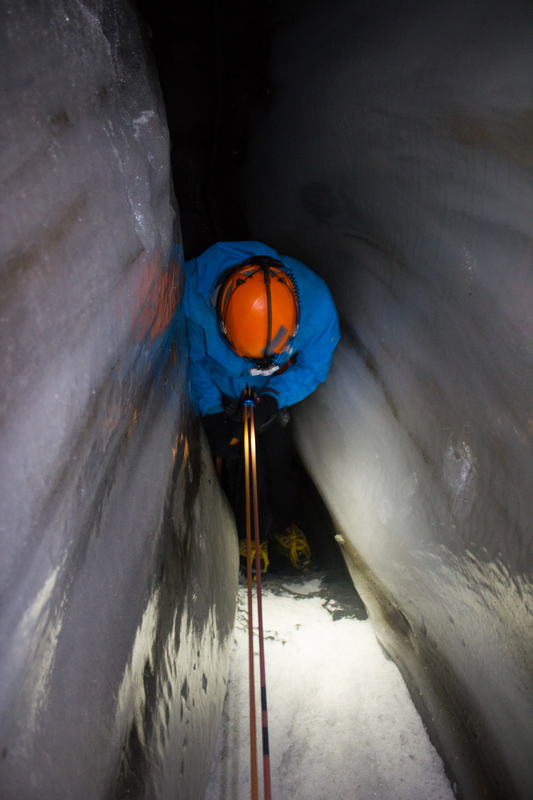 Close to the base of the glacier, looking upwards through the section we had just rappelled down. The dark bands in the ice are layers of debris and sediment (rock and soil) that has been picked up by the glacier as it moved along the valley floor. Wide. 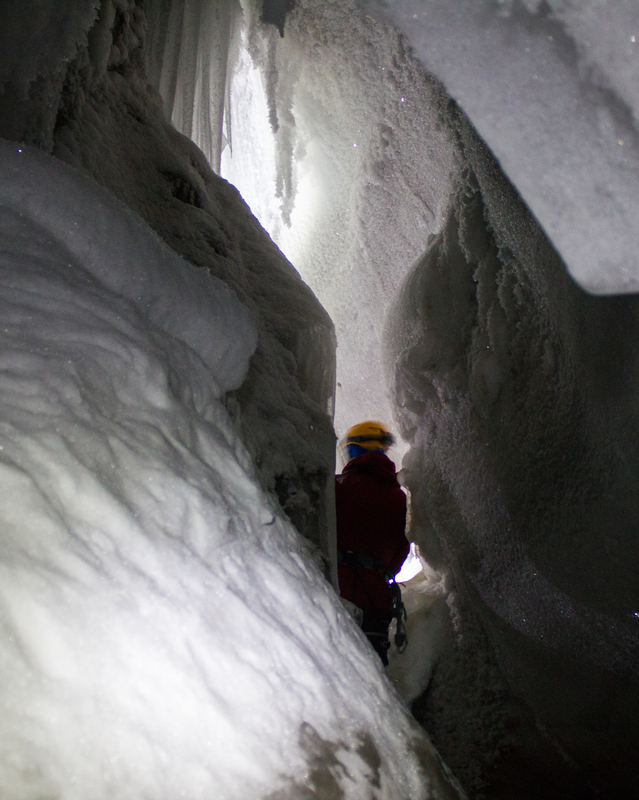 We reached the base of the glacier to find a cathedral of ice. 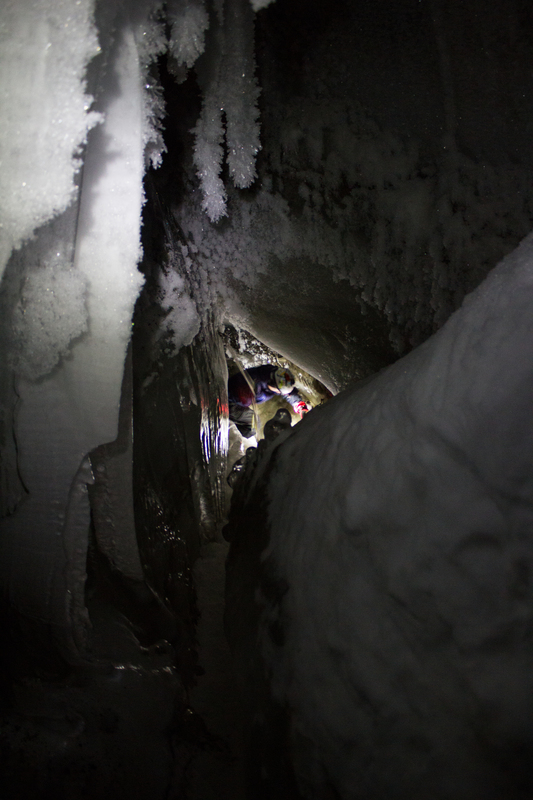 Crawling through an R channel (a tunnel cut into the bottom of the ice by a stream running along the bed), with the entire glacier above our heads. End of the line. The channel eventually became too narrow for us to proceed further. 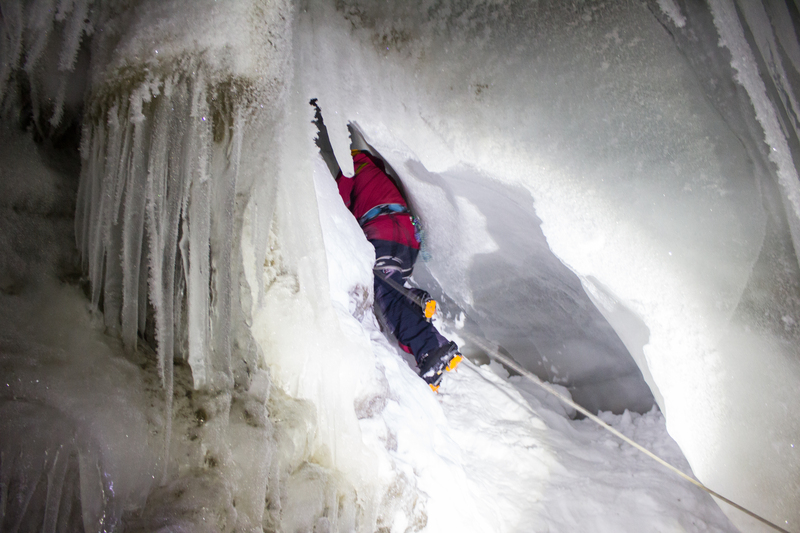 Belaying Tom up the last pitch of ice climbing (photo: Andi Alex). 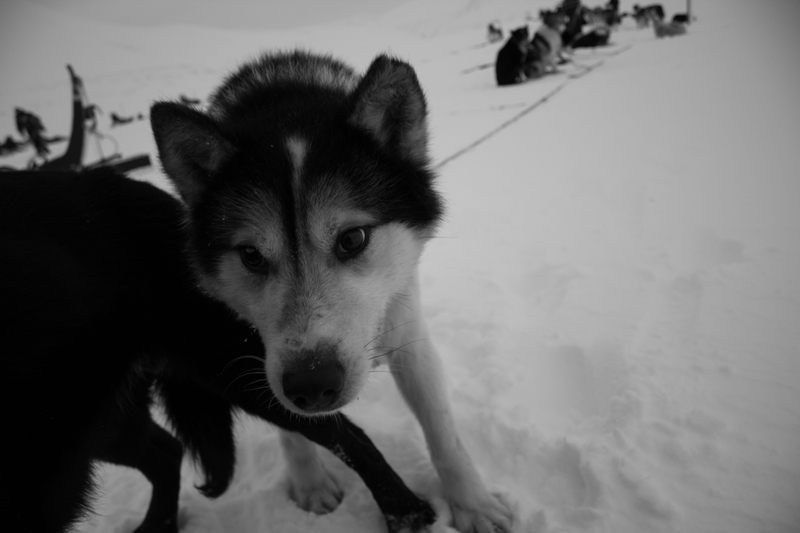 Back on the surface, and being watched by a distant reindeer (photo: Andi Alex). 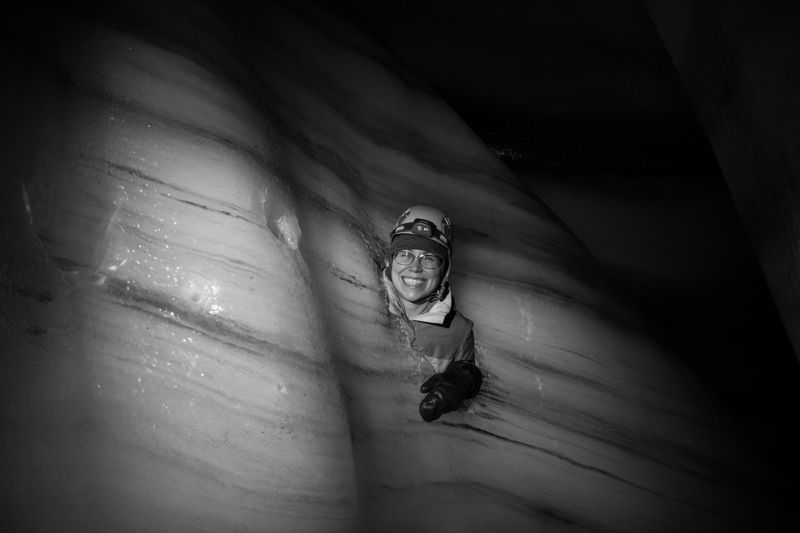 We found the bed of the glacier, and it was an awe inspiring experience to have this entire mass of ice lying above us. My thanks to my like-minded companions on both trips for their company; the highlight of being in such incredible places is to share it with great people. The Earth has approximately 170,000 glaciers, located in a range of environments from Alaska to Argentina, Nepal to New Zealand. Almost all of them are shrinking. The measure of the growth or shrinkage of a glacier is known as its mass balance, and this was the area of focus during my first week here in Svalbard. 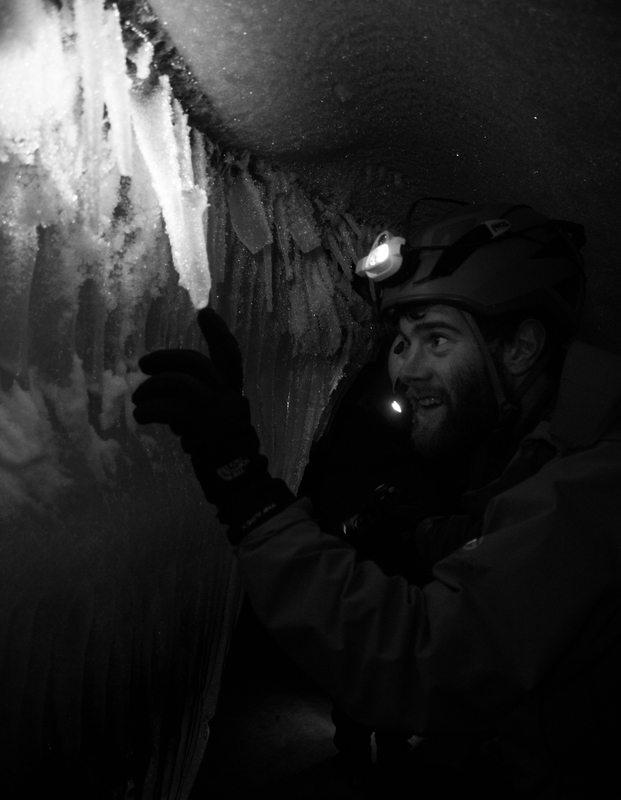 As part of the glaciology program I’m involved in, we traveled to one of the local glaciers to examine the layers of snow on its surface, and to hopefully explore some of its inner workings. 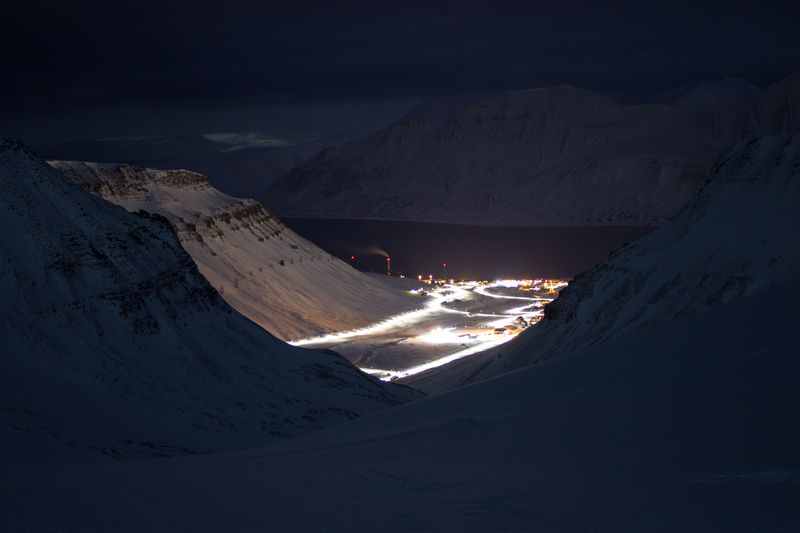 Named (somewhat ironically) after a local coal mining manager in the early 1900’s, Scott Turnerbreen is located in a valley to the south east of Longyearbyen. Glaciers are formed where snow is able to build up over time, and gradually get squeezed or compressed into ice by the weight of the snow on top. The growth of a glacier is essentially a balance between how much goes in i.e. snow, and how much goes out i.e. melting. If more snow and ice is added to a glacier than is melted, the glacier grows; if more ice melts than is replaced by snow, the glacier shrinks. Think of it as a bank account; lodge more money than you withdraw, and your account grows, and vice versa. Warmer climate conditions have increased melt rates on glaciers, removing ice faster than it can be replaced by snowfall. We built the deluxe snowpit model, including a lunch seat. 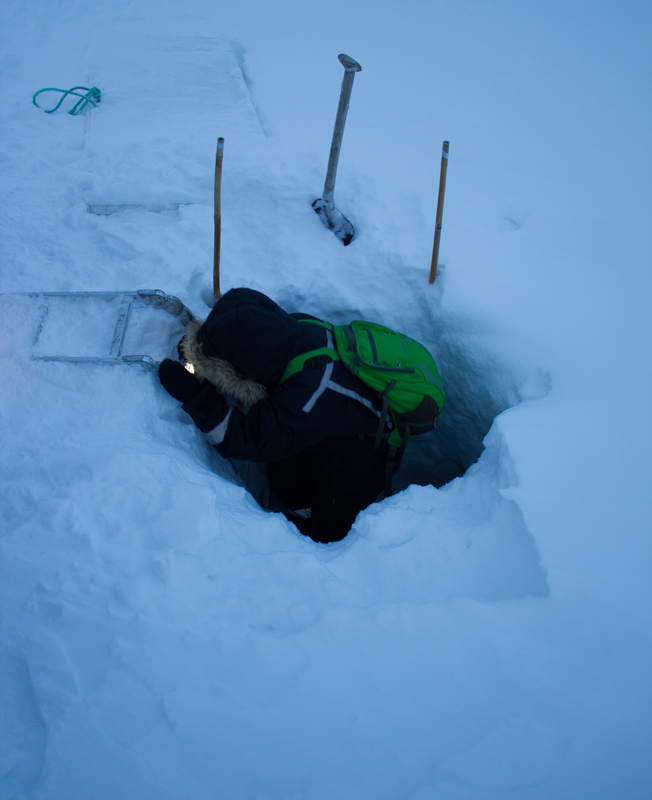 On Scott Turnerbreen, we carried out a number of surveys of the snowpack. 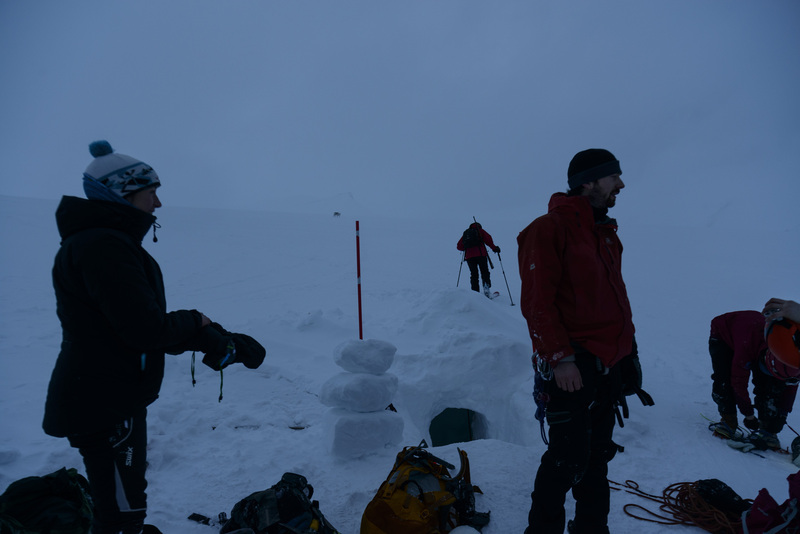 Firstly, we used snow probes (basically long tubular measuring sticks) to determine the depth and pattern of snow accumulation over the surface. 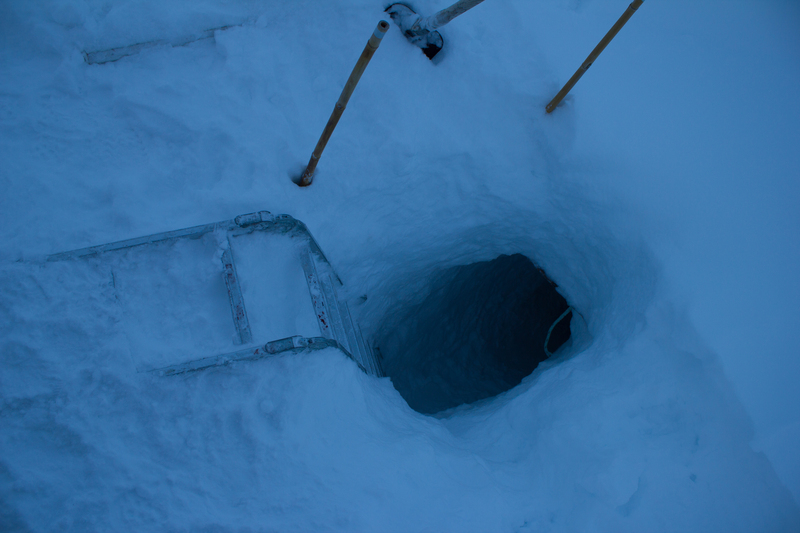 We then dug a series of snowpits to examine the thickness and density of layers in the snow, and to look for evidence of a recent ‘warm’ weather spell. 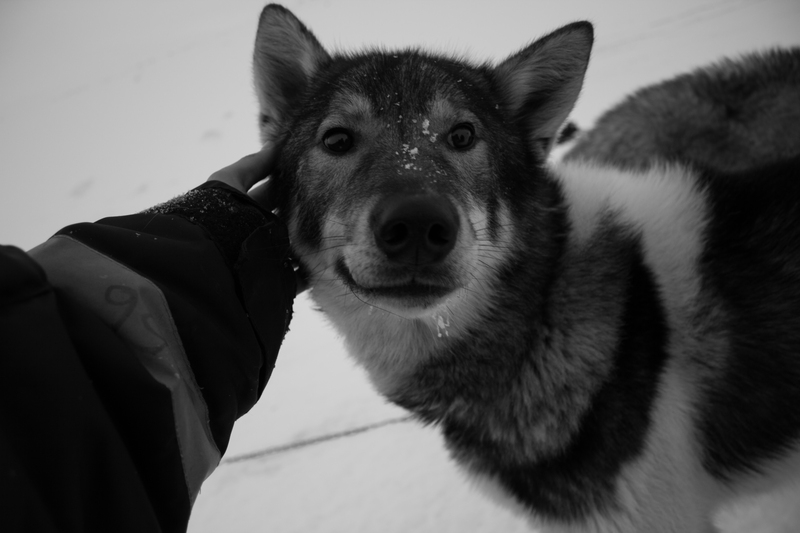 That was, of course, until getting completely distracted by a passing group of dog sleds. When in the Arctic. 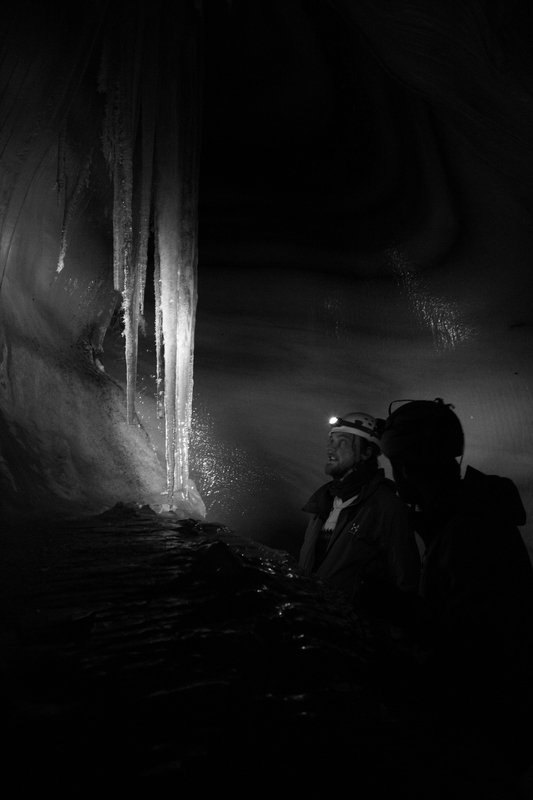 Our attention then turned from the surface of the glacier to deeper into its core. 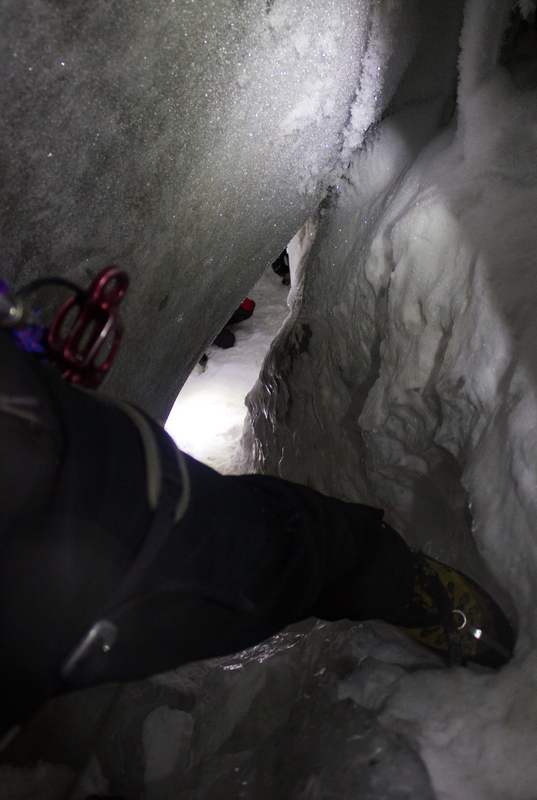 In order to gain access to the inner glacier, we descended down through a presently dry meltwater channel. 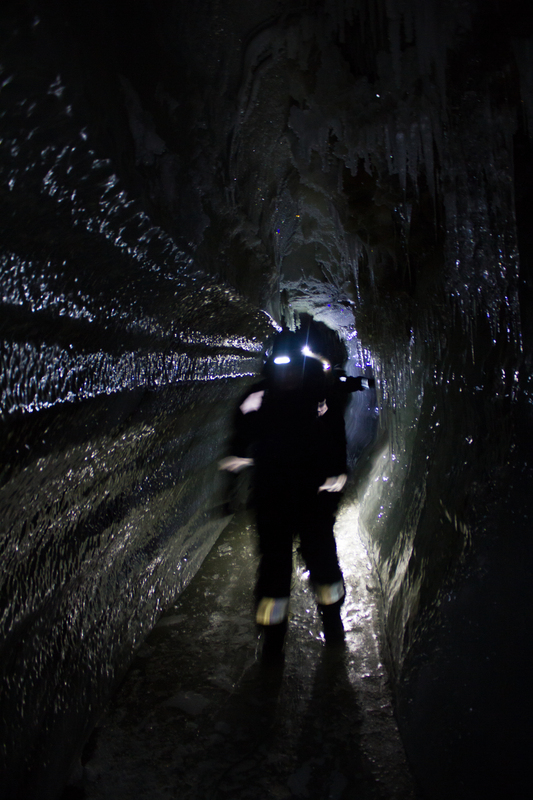 Like a scene from a Jules Verne novel, we traveled through a subsurface tunnel of ice with incredible formations and patterns. This was a brief visit, but I’m hoping to return to these passages while I’m here, and spend a little time to get some images that do them justice. 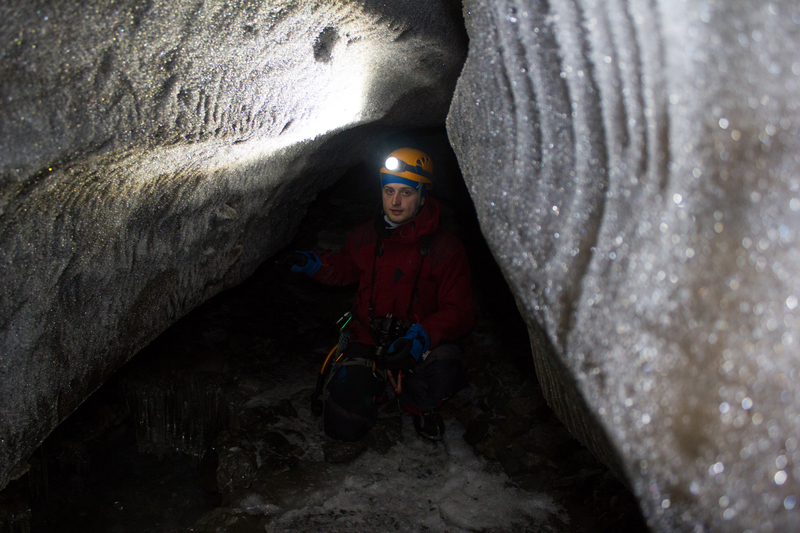 Crevasses or cracks on the glacier surface can collect dust or sediment. 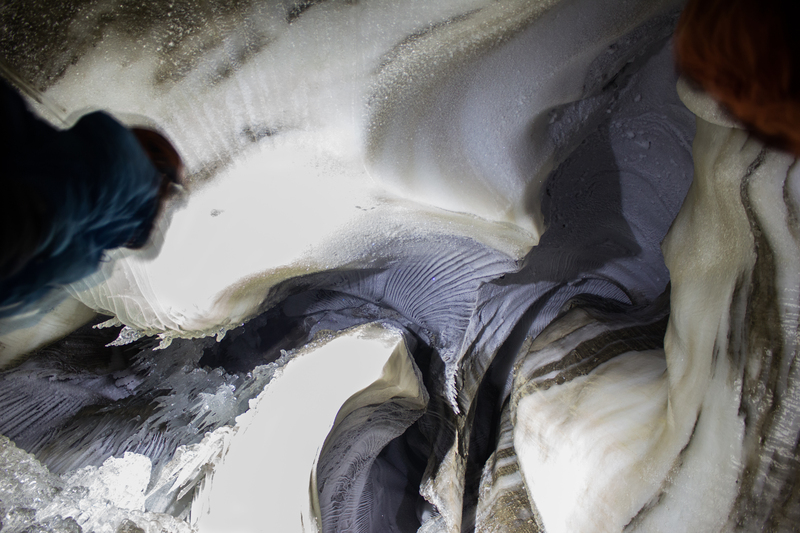 The dark coloured bands in this image may represent old crevasses which have closed and been buried deeper into the glacier, leaving behind a layer of dust in the ice. 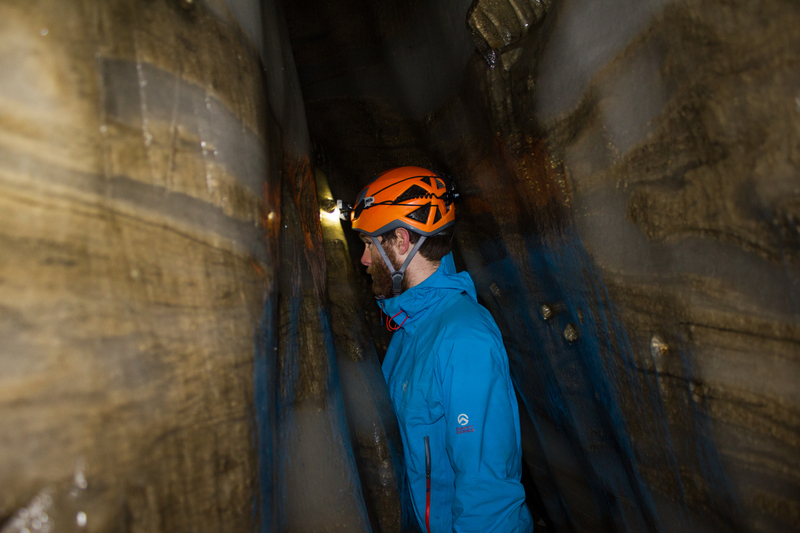 Up next: Exploring the surrounding mountains in the search for sun.